I’m not a comic book fan. In fact, the couple times I’ve tried to read comic books, I’ve come away frustrated and annoyed. Mostly because I read too fast and I don’t stop to appreciate the art. 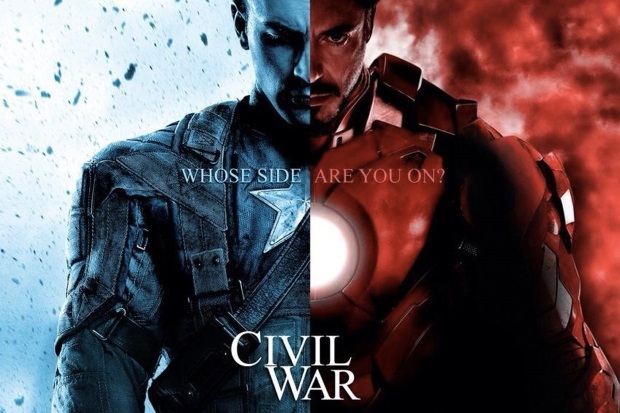 That said, I did read up on what “Civil War” would involve, seeing as I love the Marvel movies. As the characters have grown through multiple movies, I find myself liking the series more and more. Captain America has become my favorite… because unlike the other characters, he doesn’t struggle with the power he has, he struggles to do as much good as he can. In fact, while I really liked and identified with Tony Stark back in Iron Man… well, I think he’s kind of turned into a self-absorbed a-hole of late. Which sets him up brilliantly in this movie. What we have is a fight where everyone has grounded, established reasons for picking sides over the stated premise. In fact, it’s brilliantly established that the central characters have multiple reasons, some of them they may not even realize themselves, to oppose one another. It gets better, though. The fantastic writing pays out in scene after scene. New characters are brought in perfectly, in a way that doesn’t break up the action or come across with inconsistency. One scene flows into the next and when you finally feel like you can’t take anymore, the action takes a break and gives you some time to recover. There’s fantastic use of dramatic tension and symbolism. In just about every scene I would think to myself “wow, I see what you did there, good job.” This is storytelling at it’s finest. You’re here to see what would make Earth’s defenders throw down and they deliver… in a way that doesn’t leave you doubting why for an instant. I don’t normally like movies where the good guys are at odds. In fact, it’s a storyline that I hate in books, movies, and TV. Having been at odds with friends before, I hate the feeling, the anger and at the same time that feeling that something in the world is wrong. Seeing it in movies often just makes me irritated. In Captain America Civil War, there’s none of that. Yes, I wish that our heroes would stop and talk things out, but their circumstances are such that they have no choice other than to be who they are. Besides, we came to see them punching each other. Thematically, Civil War is about individual rights and freedoms against the collective. In my mind, they pulled it off brilliantly. There were no compromises, no pulled punches. These superheroes are responsible for saving or failing to save the lives of thousands, maybe millions (possibly all of Earth). Their fight right now comes back to the very reasons they are heroes. It’s simple enough to say “I’m the good guy, this is just what I do.” It’s a lot harder to make a movie like this, where the heroes are forced to confront their own moralities. Would I have liked a different storyline? Probably… but I think the movies would be poorer for it. In Captain America: Civil War the writers and directors drew a line in the sand. They forced the characters to grow and us as an audience as well. If we want to watch big stupid men pummel each other and slaughter enemies without consequence, we should go watch some other movies (Looking at you DC). If we want to see genuine, real, people, who do what they do for complex reasons and who really struggle to improve the world and take responsibility for their actions, then this is the movie you should be watching. If you’ve enjoyed any of the Marvel movies, go and see Civil War. You won’t regret it.